Why does this always have to be the case? Do mammas have some sort of magic wands? All they have to say Abra-ka-dabra or gilli gilli chooo and the crying STOPS! From the husband, nanny, the ‘well-meaning’ mother-in-law, and the whole world, why does everyone just ASSUME that mamma knows everything? How can she? She wasn’t born a mother. Mothering is really tough. Name ONE job on this planet which is as tough as being a mom. Plus, babies don’t come with a manual on motherhood, do they? Sonali has lent her voice to All Out’s #MujheSabNahiPata campaign, which encourages mothers all over India, to come forward and acknowledge that they did not know something about their child’s well-being. In a world of constantly merging threats, if you allow yourself to feel soul-crushing guilt for every choice you make as a parent, or things that may have been overlooked unintentionally, it will take a toll on you. 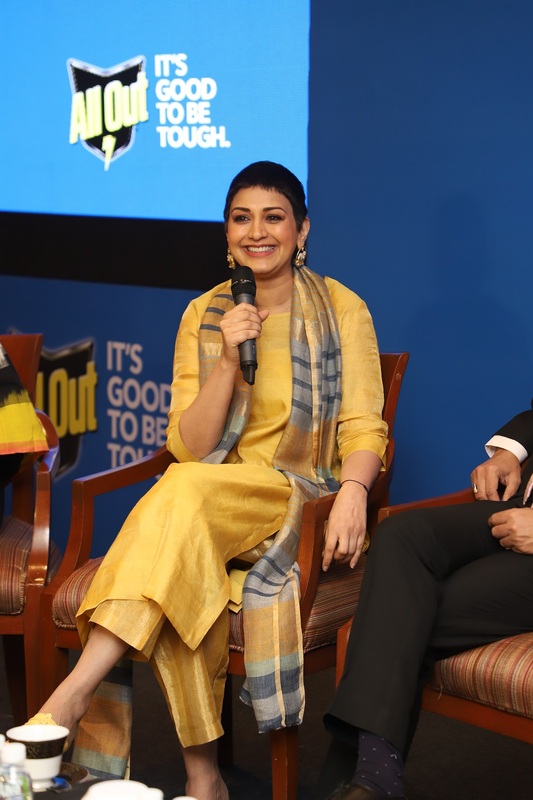 At an event organized for the campaign, one of the panelists, Ruchita Dar Shah, founder of the popular mommy community First Moms Club, put it – “The moment baby is out, GUILT enters our anatomy”. Should I leave my baby and go for a run/waxing-threading/catch a nap? Am I feeding him/her alright and enough variety? Am I doing enough research to buy him the right books? Am I doing everything that I need to for my child? Or am I missing some stuff? And boy, what follows is this Titanic-sized pressure to comply with that one line ‘mamma knows everything’. Obviously, there will be several occasions when you will feel that you have failed. There is no defined path to becoming a perfect mother, but a million ways to be all messed up thanks to the social pressure. Mothers CANNOT know everything. Could she have known that the Dengue mosquito doesn’t breed only in dirty water? Like renowned Mumbai-based pediatrician Dr Samir Dalwai, who was one of the panelists at the event explained that it can also breed in clean water, like in a flower vase kept at home. Thank you All Out for starting this campaign and taking a powerful stand for mothers in India and helping them to say #MujheSabNahiPata. Thank you for acknowledging that a mother cannot possibly know everything and starting this dialogue, for I am able to take a massive load, a part of mom-guilt, off my chest today. And I believe that many others who attended the event, the ones who have watched or will watch the commercial in the future will also be able to do so. Sharing your experience with other moms will empower them to be more vigilant about their child’s health and be better prepared. To remind yourself that it’s okay to not know everything, follow the olden practice of tying a knot at the end of your dupatta, scarf or saree. All you moms out there, let go of that ‘mom-guilt’ and share your #MujheSabNahiPata story with all of us. I look forward to hearing from you in the comments section.